Whats the difference between a ticket type and a capacity? In TicketCo, there are two important concepts when it comes to the tickets that will be available for sale. Ticket types are as they sound, these are the types of tickets you want to sell. Examples of this would be "Adult", "Child", or "Friday pass" . 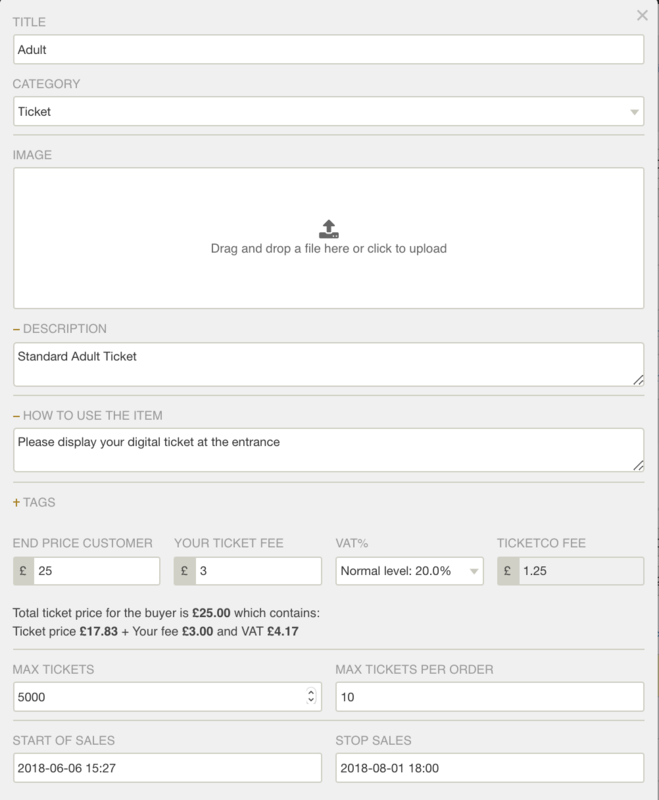 A ticket type contains information such as price, VAT, amount of available tickets etc. A capacity is a limit for how many tickets you can sell of a group of ticket types. For example if a venue capacity is 200, then you only want to sell 200 tickets of any type. Therefore 200 would be the capacity limit. You are having a concert where you want to sell two ticket types; "Child" and "Adult". You can have a maximum attendance of 200. How can you put your tickets up for sale so you do not have to split the ticket sales to 100 adult tickets and 100 child tickets? If you set the capacity at 200, and add both the ticket types to this capacity, you will never exceed the set limit of 200. You could sell 100 in each ticket type, 200 in one and 0 in the other, and everything in-between. When you add the ticket types to a capacity you also set a limit on how many tickets of that specific type you want to sell. In the example above you would set the limit on both ticket types at 200 because you potentially want to sell 200 adult tickets. Let's say you wanted to add a VIP package. This VIP package is still deducting from the 200 tickets available, however you can only sell 10 of these ticket types. Then you will add a ticket type named VIP in the same capacity as the other ticket types, but set a restriction of available tickets in the ticket type settings. 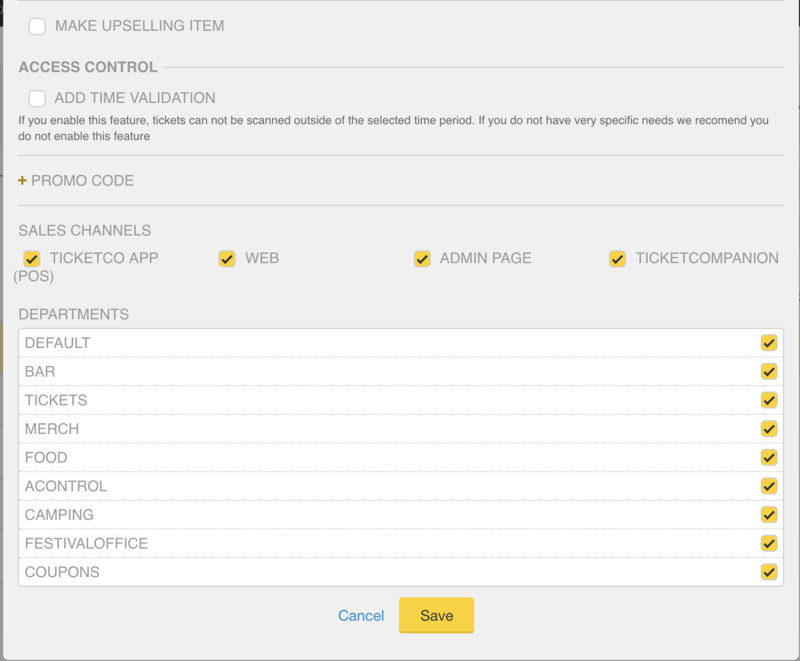 To create a capacity simply go to the Ticket types tab within the event you've created. Click the Create new capacity button. You can now create ticket types within the capacity. Here you can add an image for your ticket. This image will be shown on the page where the customer selects what tickets and items to buy, but it will also show when selling from the TicketCo app. If you are selling food and beverage for example it can be a good idea to add an image of a beer on the beer item to make it easier for the person selling to select the right items. This image will also show when the ticket is scanned. Here you can describe what is included with the ticket, when the ticket is valid and add any other relevant information. This text is displayed both on the purchase page but also on the ticket itself. "Valid for children between ages 4 - 12"
"Gives you access to the VIP area"
"Student ID required upon entry"
This text is only shown on the ticket itself. That means that you can use this field to communicate a message to only those who buy the ticket. For example you can use this to inform the buyer about entry time, special offers, or how to exchange the festival ticket with a wristband. Tags are only necessary if you use our API or our Zapier integration. They can be used to filter data based the tags you applied to the ticket types. If you do not use our API or Zapier you can safely skip this field. This is the price the customer pays upon ordering. We will never add fees or VAT on top of this price. The customer will always be able to see the total price throughout the purchasing journey. This is your ticket fee. If you choose to specify a ticketing fee, it will not be added on top of the price, but will be specified as a fee included in the price. Normally this is not necessary and you can leave this at 0. Here you can specify the product's VAT level. Just as the ticket fee, this will not be added on top of the price, but as a specification of the price. *Note that we differentiate what you set as the VAT and what TicketCo invoices as VAT charges. This makes less work for you accountant. Find out more about this here (Need link to translated article). This is the total amount of tickets you have to sell for this ticket type. Keep in mind that the capacity explained above will also limit how many tickets can be sold. This is the limit of the amount of tickets of this type the customer can buy in the same order. This is the window that you want to make this ticket available for purchase. Be extra careful that you set the correct dates here. Note: this will be automatically be set from the current date, up until when the event ends, so you may not need to change these. You can make a ticket to only be available for "upsell" this means that once the customer has selected a ticket, it will take them to another page asking them if they would like to purchase this ticket. You can set where this ticket is available for sale. You have the option of selling through the app (POS), online on the event page, in the back-end admin pages, and through the TicketCo Wallet which is the customer-end app where they can also store their tickets. This can be used to make tickets only available in specific channels. For example more expensive tickets at the door or cheaper tickets if you buy through the app.